Lot 1. 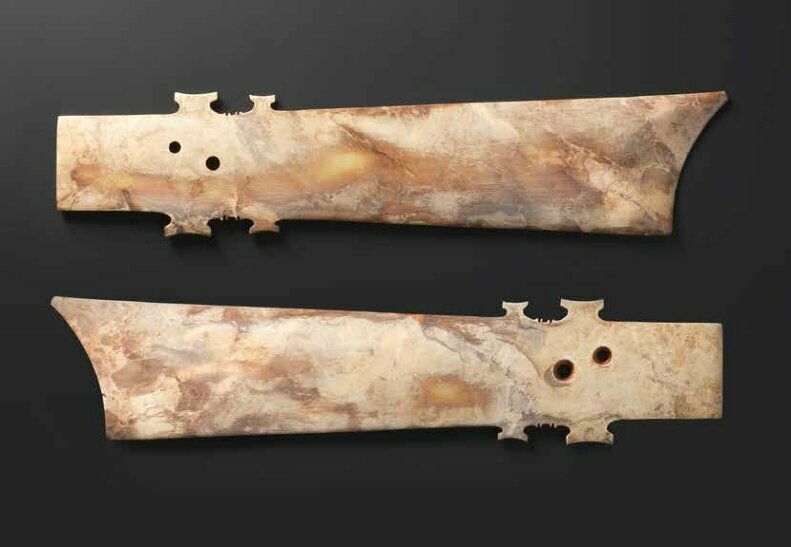 A rare and large mottled beige jade blade, yazhang, Neolithic period. 41.6cm (16 3/8in) long. Estimate £3,000 - 5,000 (€3,400 - 5,700). 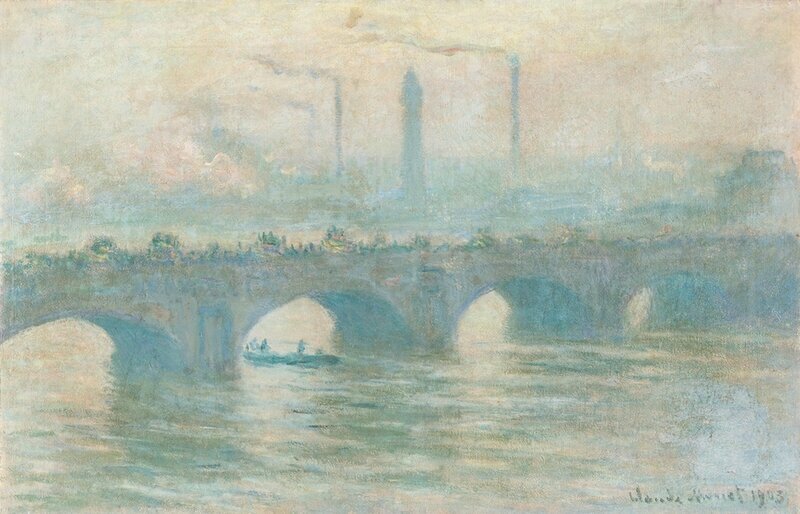 Sold for £81,250 (€91,670). Photo: Bonhams. Carved as a thin rectangular blade with tapering sides, pierced with two apertures to one end flanked by a pair of notches to the edge, the stone of a mottled and creamy tone, fitted box. (2). Provenance: the Sze Yuan Tang collection, acquired in Hong Kong circa 1980s-1990s. Note: Compare a related brownish-olive jade ceremonial blade, Qijia Culture, circa 2000 – 1700 BC, of similar form but smaller in size, which was sold at Christie's New York, 18 March 2009, lot 276. Another related brownish-olive jade ceremonial blade, Qijia Culture, was sold at Christie's New York, 13-14 September 2012, lot 1002. 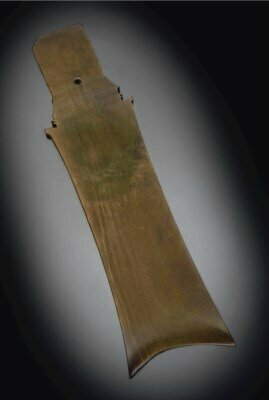 A brownish-olive jade ceremonial blade, yazhang, possibly Northwest China, Qijia culture, circa 2000-1700 BC. 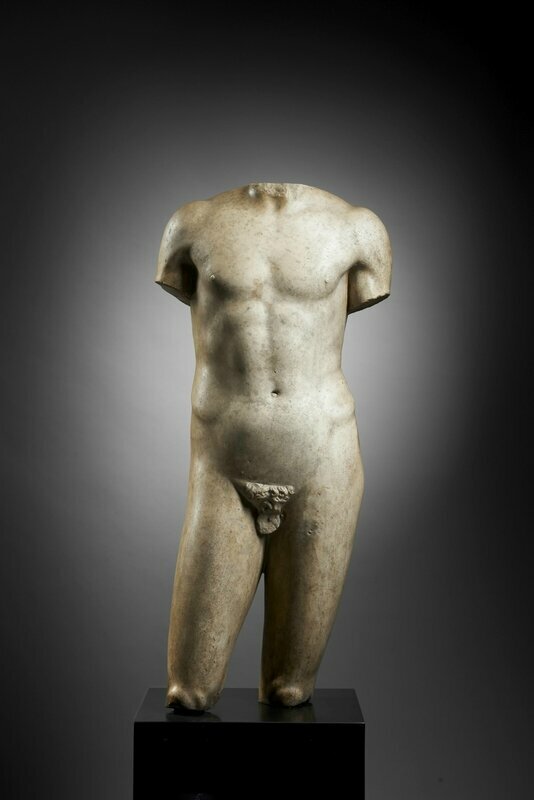 Sold for 74,500 USD at Christie's New York, 13-14 September 2012, lot 1002. © Christie's Images Ltd 2012. Lot 2. A very rare black and brown jade stem cup, Western Han Dynasty (202 BC-AD 9). 10.1cm (4in) high. Estimate £6,000 - 8,000 (€6,900 - 9,200). Sold for £31,250 (€35,257). Photo: Bonhams. Of cylindrical form supported on a waisted circular foot, intricately carved to the exterior body with a dense ground of interlocking C-scrolls above lappets, all below a band of archaistic scrolls to the rim, the stone of a mottled tone thinning to pale green colour with creamy inclusions, box. (2). 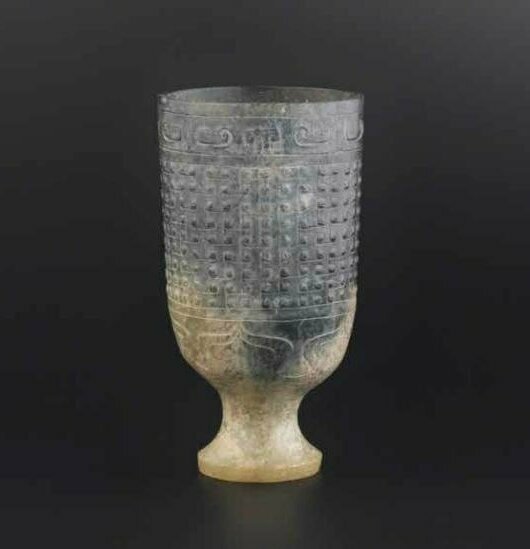 Note: Compare a related jade stem cup, Western Han dynasty, excavated from the tomb of the King of Nanyue in 1983, Xianggangshan, Guangzhou, similarly decorated with archaistic C-scrolls but raised on a bulbous foot, illustrated in Jades from the Tomb of the King of Nanyue, Hong Kong, 1991, pl.128. 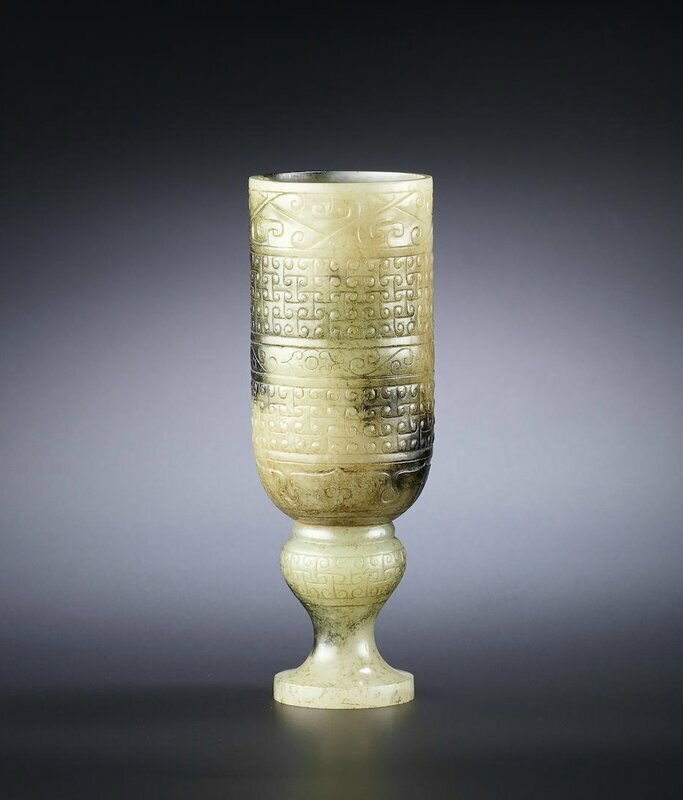 A related yellowish-grey and black jade stem cup, Western Han dynasty, was sold in our Hong Kong Rooms, 5 April 2016, lot 38. A rare yellowish-grey and black jade stem cup, Western Han Dynasty (202 BC-AD 9), from the Sze Yuan Tang collection. 11.3cm (4.1/2in) high. Sold for HK$ 10,240,000 (€1,130,330) at Bonhams Hong Kong, 5 April 2016, lot 38. Photo: Bonhams.